You’d think it would be easy to find a dead man in a cemetery. But when there are more than 6000 headstones to roam among, the search can be, well, monumental. Leo LaCourse should be simple to locate — his distinctive headstone is a granite biplane arcing into the sky. Yet, after five minutes of wandering around Hope Cemetery, I haven’t spotted it. It doesn’t help that this paean to granite artistry, north of Barre on Route 14, covers 65 acres and has roads laid out Vermont style: like meandering cow paths. No angular rows here, à la Arlington National Cemetery. Eventually LaCourse’s headstone, hidden behind a hedge, comes into view. As I stand in front of it, a disembodied voice tells me the story behind the biplane: Leo and his wife, Caroline, were civil air patrol pilots; the headstone, which took three months to create, was carved by Leo’s brother-in-law, noted Barre granite artist Giuliano Cecchinelli. The voice isn’t coming from the beyond. I’m hearing it on my cellphone, in a convenient — and new-to-Vermont — melding of technology and tourism. It’s a “cellsational tour” of Barre’s artisanal cemetery and the Rock of Ages granite quarries, in the words of Todd Paton. He heads visitor services at Rock of Ages’ modern visitors’ center in Graniteville, located high on a hillside above the city of Barre, five miles from Hope Cemetery. 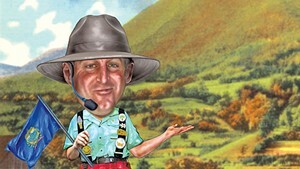 Paton developed and oversaw the launch of the cellphone tour in mid-July — so recently that it is not yet noted on the Rock of Ages website. After I decipher the cell tour map’s confusing schematics — go where the numbers are on the map, not where a monument’s image is — things begin to fall into place. I dial the main number and punch in a monument number from the tour map, and in quick order my phone reveals the backstory of Joey Laquerre Jr.’s No. 61 racecar. (The avid auto racer died in a snowmobile accident; the 1:4 scale-model monument even has a carved axle underneath.) Next, I learn about the Celtic connections of the Irish Bancroft family, whose ornate cross headstone is carved (unusually) on both sides, with eight shamrocks for eight family members. As for noted French Canadian sculptor Ron Fortier, who ran a granite shop in Barre for 37 years, my cellphone explains how this native of Maple Grove, Québec, came to carve the headstone for himself and his wife, Denise — in the shape of a maple leaf, natch. As you walk around the sunny center and shaded verdant side sections of Hope Cemetery, which opened in 1895, eye-catching monuments abound in every size and shape, from mausoleums to bas-relief figures, shiny pillars and expansive structures with numerous carved details. Twenty-six of the most prominent headstones are profiled in the cellphone tour, detailing everything from the families’ histories to the monuments’ inspirations to challenges faced by the stone artisans, whose works here include soccer balls, chairs, a bed, a violin, pietàs, angels and quite a few unusual self-portraits. Hope Cemetery’s regulations require that all monuments be carved from durable Barre gray granite, ensuring that it remains a showplace for, and enduring testament to, the skills of the area’s stone sculptors. It is already a popular tourist destination, but with the new cellphone tour, the cemetery comes alive, so to speak, with fascinating personal anecdotes about the folks buried here and how their unique headstones came to be. Take the elegant and creative monument for the Bernasconi family: Two rectangular pillars are connected by eight chain links in an arch, each carved with a name. Via cell you learn that it was no easy task to carve those links from a single piece of granite — a perilous process, since a mistake or crack would ruin the whole chain. You also learn of the chain’s lovely symbolism: two close families and their children are linked together forever by marriage. Then there’s the tragic story of gifted Italian sculptor Louis Brusa and the controversy his monument incited. Brusa fought to force the granite sheds to install dust exhaust systems, even as he was dying of silicosis. The Vermont Legislature passed a law mandating the safety measure in 1937 — too late to help Brusa, who expired the same year. The monument, which he partially carved himself to honor victims of silicosis, caused its own dustup in Barre. It depicts a dying Brusa in the arms of an unnamed standing woman, whose shapely backside was apparently too much for some proper burghers. A prominent doctor had his own (future) gravesite moved so he wouldn’t have to stare at the “blatantly pornographic statue” for eternity. Observing the figure’s slender granite form with 21st-century eyes, however, you can only marvel at how times have changed. Paton says he got the idea for the cellphone tour after hearing about a similar system at the San Diego Zoo. It’s provided by a San Francisco-based company called Guide by Cell, which has crafted mobile audio or texting technology for university museums, an outdoor public-art initiative in Kansas City and the Monterey Bay Aquarium, among others. Rock of Ages gets tourist coaches “by the hundreds” in fall and a steady stream all summer, says Paton. Many of them head to Hope Cemetery after visiting the quarry and manufacturing plant to see granite handiwork up close. But, Paton notes, the cemetery is “greatly underfunded.” He and Barre cemetery officials began working last year on the cell tour as a way to monetize the visits, as well as to enhance the experience on the grounds. Dwight Coffrin, director of cemeteries and parks for Barre, estimates that some 50,000 visitors a year pass through the town’s graveyards. The city gets $75 per bus for guiding tourist busloads in the crush of foliage season, and pulls in some money by occasionally hosting smaller groups, but many visitors arrive and wander independently without contributing to the upkeep or getting the full story. The Graniteville visitors’ center, which sells the guided-tour maps for $4.95, actively promotes Hope Cemetery in its promotional video and during tours of the working E.L. Smith Quarry. Two dozen other notable points are on the tour map, including activities in the manufacturing plant at Rock of Ages, details of granite landmarks at the visitors’ center and three noteworthy monuments in downtown Barre. The cellphone tour covers them all. Though Hope Cemetery gets most of the attention for now, Paton says he eventually plans to add Barre’s other historic and monumental cemetery, Elmwood, to the cellphone tour. Dating back to 1808, Elmwood resembles a striking 27-acre chessboard, with its many towering obelisks and pillars. Unlike Hope, with its granite solidity, Elmwood offers a time line of the monument trade, with headstones ranging from slate to marble to metal and granite. “You can go through the cemetery and see how monument styles changed,” explains Coffrin. The cell project drew from Barre’s deep well of local history experts and volunteers. Ilene Gillander, a longtime Barre resident and high school theater teacher, wrote the stories, which were narrated by locals, including some of Gillander’s former students. The cell tour isn’t perfect yet. Some of the numbers yield a dramatized story or one presented “as told by” a friend, which seem unnecessary and awkward embellishments. And, while there’s no phone charge except for airtime, it can be annoying to keep dialing in and disconnecting as you move from one section of the cemetery to another, locating monuments with the map. But the cell system is especially successful at piercing the veils of mystery surrounding many of the headstones — and there’s no shortage of those. Who is the woman rising out of the smoke in soldier Giuseppe Donati’s pipe? How on earth does the Martel monument, a cube precariously balanced on a tall pedestal, stay in place? And what do the words carved on the sides mean? What’s up with the Vrooman monument, two prominent pyramids carved with scriptural quotations? Sometimes mystery remains, though, and is even enhanced. 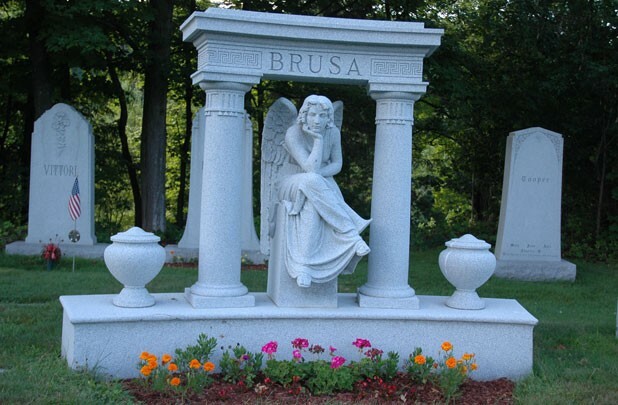 Sculptor Brusa, who carved the silicosis monument, also created one of the cemetery’s most engaging figures for the monument of a relative: a youthful, sitting angel whose head, adorned with curly, flowing hair, rests on an open palm; her elbow perches on casually crossed legs. Is she pondering life and death? Is there a hint of a smile? Was she a wife, a mistress, a friend? Her face is beguiling, and her eyes seem to return the gaze of a captivated visitor. From the cellphone, you won’t learn answers about this angel, but rather an even deeper mystery in a story nicely related by Shelley Ibey, who personally guides most of the bus tours at Hope Cemetery and is a repository of its history. As she tells it, in 2007, an elderly woman with failing health and eyesight was brought by her kids to tour the cemetery and asked if there was an angel she could “see” close up. They took her to the Brusa angel, which is close to the ground and easily viewed. She was greatly moved by the viewing, and profusely thanked Ibey. A few weeks later, one of the children called to say the woman’s sight had — against all odds — improved. She credited the angel with the gift of restoring her vision. A miracle? Who knows? as Ibey notes via cellphone. But the story certainly lends new meaning and poignancy to the name Hope Cemetery. Hope Cemetery is on Merchant Street in Barre. The Rock of Ages visitors’ center is located at 558 Graniteville Road in Graniteville, and is open Monday through Saturday, 9 a.m. to 5 p.m. Quarry tours, 9:15 a.m. to 3:35 p.m. Info, 476-3119 or rockofages.com/en/gift-shop-a-tourism.